There are three main backpacking trails in Algonquin Park and many fine shorter day walks. I have walked two of the backpacking trails and a few of the day trails. I walked the Highlands Backpacking Trail on August 21, 2013 and the Eastern Pines Backpacking Trail on September 26, 2013. . Click the links above or below to read my report on that hike. There are two official maps available: a backpacking map and the canoe guide map, both available at active park gates and in certain outdoor stores. The backpacking map is cheap and so it's a good idea to carry it, even though over 50% of it is copy on good hiking technique. Advice for a future map: more map and less fill. An online canoe routes map, courtesy of the Friends of Algonquin Park, shows the Highlands Backpacking Trail in reasonable detail. Jeff's Algonquin Park maps are more detailed. They are principally for canoeists, but hikers can get a good lay of the land from them. Algonquin Outfitter's have used Google maps to give an excellent view of Algonquin hiking trails, including the Highland backpacking trail. Check out their brief descriptions and locations of dozens of trails. The park is famous for both its canoe-in camping and its many spectacular routes. The Petawawa River to the north of the park is a favorite whitewater route in season. I have canoed that, and highly recommend it as a camping and both flatwater and whitwhater adventure. There are, of course, lots of suburban camping sites (camping beside your car along with other campers), and you can find info about that along with how to register at either of the links at the bottom of this page. There are also 14 "ranger cabins." These are pretty rustic, generally with no running water, electricity or related amenities. Some can be accessed by car, most are more difficult to get to. They cost $58 or more per night for one person, plus the regular camping fee for any extra people ($11.75 as of the end of the 2012 season), plus a $9 booking charge if you book online. That's a little unfair since it's the only way to book the cabins short of taking a chance and arriving at the gate, something I definitely wouldn't advise For two nights in 2012, it cost me $139.50 for two (somehow I avoided the telephone booking fee). They are open from April to the Friday before (Canadian) Thanksgiving. 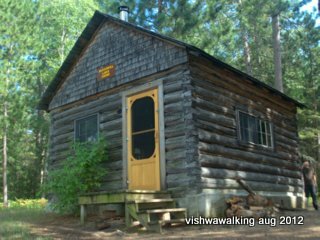 Using info from the provincial parks site, the Friends site and the Canoe Routes of Algonquin Park map, I have listed below some basic information on the 14 Ranger cabins. To book, you have to phone 1-888-668-7275; there are no online bookings. If you need specific information about a cabin (the telephone bookers do not have such information except by chance) you can phone the park direct at 705-633-5572. In general, they have no power, and no amenities. The toilet is often a basic wooden box with a lid on it, set back a bit from the cabin. I have experience with only one of these cabins, so cannot verify some of the information below. One piece of information on the cabin I did visit had incorrect information on the official site — not major stuff, but be careful of all advice. Pets are not allowed at these cabins. All fees listed are from the official site and are for one person. (Prices checked August 23, 2013; all $58.20 cabins are $365.84 per week.) . Big Crow (#757) $58.20 for one person. $365.84 per week. Built 1956. On Crow Lake in the centre of the park. Kitchen and a living area. Two bedrooms, sleeps four. Canoe access. One day to get to cabin. Lake Opeongo Access Point (#11, off Highway #60). Opeongo to Big Lake, 1,390-metre portage to Proulx Lake, up marshy river to Little Crow, short river paddle to Big Crow. Birchcliffe (#760) $58.20 Built 1962. On Birchcliffe Lake in the North-west part of the park.16' x 20' kitchen/dining, 2 small bedrooms (one with one set of bunks, the other a double bunk and a single) sleeps four. Canoe access. One long day, or perhaps two to canoe. Kawawaymog Lake Access Point (#1). Birchcliffe Creek can be difficult to navigate in July and August because of low water. Kawawaymog Lake, Amable du Ford, portage 135 metres, portage 153 m., North Tea Lake (which is big! ), portage 140 m., Mangotani and Hornbeam Lakes (including 240 and 90 and 140 m. portages), Biggar Lake, Birchcliffe Creek, 260 m. portage, Birchcliffe Lake. Total portaging: 1158 metres. Bissett Road (#756) $58.20 Built 1922. Not on a lake, but in a beaver meadow, north-east part of the park. One room, sleeps four. The Friends site says it could be noisy on weekdays with logging trucks passing by on the nearby road, but the Ontario Parks page says it is "very secluded." Car access (no car numbers noted). Access from Bissett Creek Road Access Point, (the road is off Highway #17). Brent (#763) $134.50, $914.75 per week. Built in 1932, the classiest of the cabins. North shore of Cedar Lake, north part of the park, roughly in the middle. Four bedrooms (sleeps 10),mattresses, solar lights, stone fireplace, living room, kitchen, propane stove, fridge. Car access (three vehicles allowed). Cedar Lake/Brent Access Point (#27). Brent Deputy (#764) $134.50, $914.75 per week. Built in 1930s. Close to Brent cabin (see above). One room, mattresses, 1 set bunk beds (double on the bottom), sleeps two. Propane heater, solar lights, but no fridge. Car access, one vehicle. Cedar Lake/Brent Access Point (#27). Crooked Chute (#762) $58.20 Built 1928/29, rebuilt 1995. At base of Crooked Chute on Petawawa River, north-east part of park. Sleeps eight. Outside closed-in toilets. Canoe access.Travers Access Point (#23); long drive into park (54.4 km) before paddle. The Friends call this a "leisurely day's paddle" from the access point. I paddled this river years ago; in the spring there were some exciting rapids to shoot. Be aware of the rapids at all times of the year. Highview (#758) $58.20 Built in 1922. "Just off the Nipissing River west of the 840m portage to Gibson Lake" (from the provincial site), north-east part of the park. One room, sleeps four. Canoe access. Tim River Access Point (#2) which might be the most logical, and others. Get your Park Permit at the Kearney Community Centre in Kearney. The provincial site says this could be one long day or perhaps a two-day paddle. This one looks complicated; rather than list the rivers lakes and portages, check out the map. The cabin is on the river. The map indicates that "low water can be a major problem" on the Tim River between Tim Lake and Rosebary Lake, so perhaps an approach from the east would work better. Kiosk (#759) $129, $839.30 per week. Built 1933. 2 bedroom, six people. On Kioshkokwi Lake in the north-west corner of the park. Mattresses, electric fridge, stove, heat. Two bedroom, six people. Car Access, two vehicles. Kioshkokwi Lake-Kiosk Access Point (#29). Kitty Lake (#752) $58.20 Built 1935. Actually on Farm Lake in the south-central part of the park. One room (but listed as one of the larger cabins), sleeps eight. Canoe access. One hour paddle from the Shall Lake Access Point (#17). Lost Coin Lake (#755) $58.20 Built 1936. On Coin Lake, in the north-east part of the park. One room, sleeps four. Coin Lake has a weedy shoreline (no swimming). The Friends say it has " great hiking and wildlife viewing opportunities on old roads in the vicinity." Hiking access. Bissett Lake Access (#24). Drive Bissett Lake Road to the park boundary. Although (like McKaskill cabin) the road is decent, you must hike or bike what the Friends say is a seven-kilometre stretch of road to the cabin. McKaskill Lake (#753) $58.20 Built 1932. On McKaskill Lake, in the south of the park, slightly closer to the eastern border than the western border. One room, two sets of bunks sleeps four. Hike or canoe access. Canoeing: one day, Shall Lake Access Point (#17). Hiking: Basin Lake Access Point (#19) (hiking 10.5 km along a well-kept logging road). I have stayed at this cabin. See my report here. Rain Lake $92.10 for one person, 565 per week. No record of time built. On Rain Lake in the far east of the park about halfway to the north border. Screened-in porch, two bedrooms, mattresses, sleeps 4. This cabin has access to the Western Uplands Backpacking Trail. Car access, two vehicles. Get your Park Permit at the Kearney Community Centre in Kearney. Rain Lake Access Point (#4). Get your Park Permit at the Kearney Community Centre in Kearney. Tattler Lake (#761) $58. No record of time built. On Tattler Lake, in the south-central part of the park. Canoe access. Shall Lake (#17) or Opeongo (#11) access points. One room, sleeps four. Canoe access. Shall Lake Access Point looks to be the easiest. Tattler is just north of Booth Lake, really a widening of the Opeongo River. Looks like a liesurely day's paddle. From the Shall Lake Access Point, up to Farm Lake, portage 25 m., Kitty Lake, portage 550 m., Booth Lake, Tatler Lake. Total portaging: 575 m.
Wenda Lake $58. Built in 1920s (Friends' guess). On Wenda Lake, in the eastern part of the park, about halfway to the northern border. No wood-burning stove. One room, sleeps four. Canoe access. Grand Lake Achray Access Point (#22). From access point, across to "scenic" Caracajou Bay, High Falls (portage 90 m.), shortish river section, portage 190 m., Lower Spectacle Lake, portage 155 metres, Upper Spectacle Lake, portage 1,270 m, short river section, portage 365 m, Little Caracajou Lake, portage 275 m., Wenda Lake. Total portaging; 2,345 m. Alternatively, you can portage directly from Grand Lake: access point, north up Grand Lake, 3,620 m. portage to Wenda. The Friends site says this portage is not only long, but can be arduous because of its steep grade. Stash the canoe at the Grand Lake end of the portage and simply hike? Dunno. Algonquin Park page, from the provincial parks site. Friends of Algonquin Park homepage. Holy Old Whistlin': Yarns about Algonquin Park Loggers This is a google page advertising a book. If you want to read the whole book, you'll have to buy it. However, there are some good yarns in the teaser.